Socially Awkward Penguin is arguably one of the most recognizable memes on the Internet. The blue-backgrounded image of the off-balance penguin — superimposed with funny text — has been plastered across every message board, forum and social network on the Web. It’s an inside joke. An icon. A mascot, even. It’s also the intellectual property of National Geographic, which — awkward! — suddenly wants Internet users to pay up for posting it. In the past year, the company’s licensing agency, Getty Images, has “pursued and settled” multiple infringement cases involving Socially Awkward Penguin, it confirmed to The Post. All of those actions were carried out in secret, with blogs and other posters agreeing to non-disclosure. But over the summer, when Getty attempted to collect almost $900 in licensing fees from a German blog, its parent site, getDigital, published Getty’s letters online. And the ensuing outrage has sparked a wide-ranging debate about what Internet creativity, ownership and culture should look like. This is not, incidentally, the first time that someone has tried to play the copyright card over a well-known meme: The viral depot Know Your Meme actually keeps a public log of its copyright takedown requests, which have included everything from Good Girl Gina to Scumbag Stacy. Since then, Socially Awkward Penguin has appeared in or on advertisements, ties, shot glasses, Denny’s GIFs and baby onesies. You can buy the Awkward Penguin iPhone app for 99 cents, if you’re so inclined. A popular Tumblr blog, called “F— Yeah Socially Awkward Penguin,” has spent six whole years chronicling the meme, one of the innumerable blogs and Web sites to republish, remix and reshare it. In February 2012, for instance, a German blog called Geek Sisters posted a very brief admiration of the penguin, which writer Gesine called her “lieblingsmeme” (favorite meme) and personal reminder that the Internet “is a great invention.” This, it turns out, was a rather big mistake: Three years later, Geek Sisters’s corporate parent, getDigital, received a sternly worded e-mail from Getty Images, informing them that they needed to pay for a license or face legal action. The request was unexpected on several fronts, said Krug, a week after his company paid up. While getDigital is a for-profit retail company, similar to Virginia’s Think Geek, Geek Sisters is a non-commercial blog — in fact, it’s pretty damn obscure. (The penguin post got no comments, and has never been shared on Twitter or Facebook.) Furthermore, even after getDigital paid almost $900 in back licensing fees and took the images down, Getty had another condition for them: The company could never disclose the fact that Getty had approached them, or that the two companies had reached a settlement. To Krug and his colleagues, something smelled fishy: They suspected that Getty was systematically shaking down small blogs who couldn’t push back. But what of the “artists” whom Getty does not work with — the ones who have contributed to the vast oeuvre that is Socially Awkward Penguin? In the six years that Getty and National Geographic have allowed the meme to flourish, it has far transcended Mobley’s original photo: It’s a remix, a discourse, a pastiche assembled — like so much of popular Internet culture! — from the aggregated efforts of millions of people. Is it silly? Yeah. It’s a talking penguin. But it’s also the cornerstone of a thriving, mash-up culture, one that transforms even the most staid nature photography into commentaries on politics, technology and modern life: think of Confession Bear, or Religion Pigeon, or Actual Advice Mallard. Alas, experts don’t know whether memes and image macros count as “cultural products” or “transformations” in the legal sense. If courts do interpret these memes as works of art or commentary, then they don’t owe anything to Getty and its ilk. No one’s ever mounted that defense, though, and it hasn’t been tested in court: In order for that to happen, some small-time blog would have to wage a very expensive lawsuit, against a much larger company … over a picture of a penguin. Instead, most do what getDigital did: pay up and delete it. This concerns Hwang, who, in another life, earned a law degree in between organizing editions of ROFLCon, one of the first conferences dedicated to memes and Internet celebrities. Individual copyright-holders — say, Nyan Cat creator Christopher Torres, who sued Warner Bros. in 2013 — don’t have that much power to silence Internet speech or scare users away from their favorite memes. But major stock photo services, talent agencies, and viral “managers” with high-powered legal teams do: These businesses exist solely “to control access to content,” and they can do so aggressively. Internet culture is also slippery, though — and it tends to adapt. 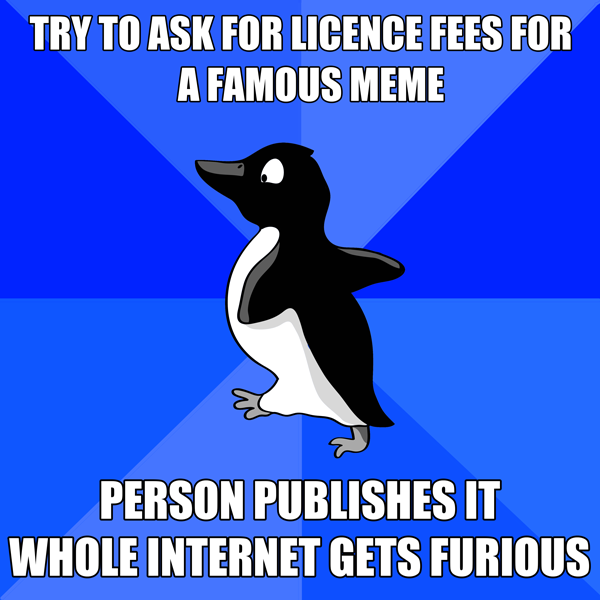 In the week since it publicized its battle with Getty, getDigital released its own, illustrated version of Socially Awkward Penguin meme, free for anyone to repost or remix.